Holiday hours: Closed on New Year's Day, Memorial Day, July 4th, Labor Day, Thanksgiving and Christmas. Providing individuals & businesses with personalized, quality services. 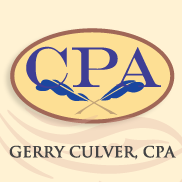 German P. Culver, Jr., CPA, PC - accounting & tax services for individuals & small business owners. As a local Culpeper public accountant and tax preparation firm, we have helped many local businesses with small business accounting services including outsourced accounting and bookkeeping, tax preparation and planning, new business advisement, IRS help and more. We work hard to provide our clients with reliable accounting services and understand that each business and individual has different financial & accounting needs. We take the time to get to know you and your business so that we can build a long-lasting professional relationship for years to come. Free initial consultation to enable you to get to know us and discuss the needs of your business.